In the world of dentistry, there are more options than ever before when it comes to aligning your teeth. Gone are the days of only being able to choose the color of the rubber bands but nothing else about your braces. You now have the ability to completely forego braces altogether while still achieving a dramatically improved smile and oral health. It’s called Invisalign®, and it’s the world’s most advanced clear aligner system. Over 4 million people have chosen to utilize this virtually invisible and seamless option. Choose Your Downtown Dentistry for the clear aligner system, Invisalign®, which has over 20 years of clinically-based research to support it. Invisalign® has continuously been optimized over this time period, with the 4 million cases being a significant contributing factor in its efficacy. Comfortable Fit – Our clear aligner system is made of SmartTrack material. This makes them easier to take off for meals and clean. Unique Design For Teenagers – Choose Invisalign® clear aligners which fade from blue to clear over time to aid in determining wear-duration. Experience More Than 50 Percent Treatment Times** – Compare Invisalign® to braces and the process and results make it a favorable choice for a variety of reasons. Achieve your most beautiful smile faster than ever before. The treatment process of Invisalign® is typically much more straightforward than the often arduous process of wearing braces for an extended period of time. 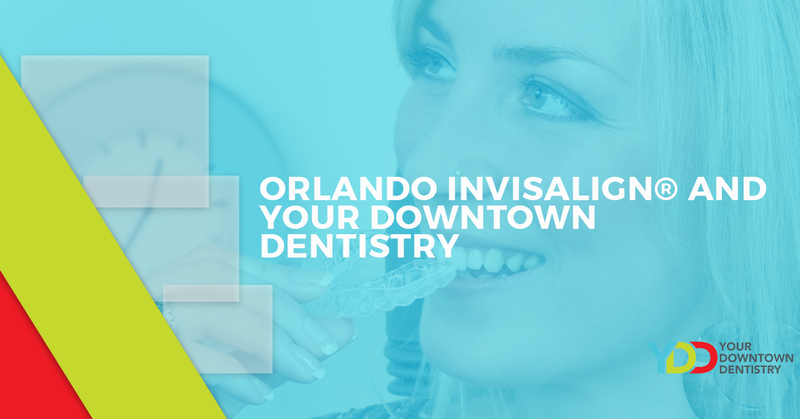 From your first consultation at Your Downtown Dentistry in Orlando until your most beautiful smile has been accomplished, the process is understandable and should be stress-free. During your first consultation at Your Downtown Dentistry, our Invisalign®-experienced doctor will talk with you about your unique needs to determine if Invisalign® is the best route for you. At Your Downtown Dentistry, we have a long-term, client-centered approach with your best interests in mind. There are many factors worth considering when it comes to your oral health, and we are happy to walk through these with you. Should you elect to go the Invisalign® route, we will use a digital scanning system to develop precise 3D images of your teeth, upon which we will outline a custom treatment plan which will your include teeth movement trajectory and treatment timeline. Invisalign® clear aligners are as close to invisible as is possible, which means most people won’t be able to notice you wearing them. Contrast that with the prospect of braces, and you begin to understand why so many people are electing to go the Invisalign® route. Most people are expected to wear their Invisalign® aligners between 20 and 22 hours per day for best results. You can take them out to eat, brush, and floss. As you progress, you’ll get new sets of aligners to help gently shift your teeth into place. Every aligner adjusts your teeth in a gradual way, both horizontally and vertically. If necessary, Invisalign® clear aligners can rotate teeth as well. It’s often the case that our doctors will recommend their patients to progress to a new set of aligners each week, with checkups every six weeks or so. Each patient is unique, which is why we set up each of our patients with a custom treatment plan here at Your Downtown Dentistry. Reach out to Orlando’s choice for family dental care, cosmetic, and restorative dentistry. The good folks here at Your Downtown Dentistry would love to help you achieve your most beautiful smile!